1. Sometimes half weeks can seem extremely long. 2. I can get Isabel and I ready really fast when I sleep through my alarm for 45 minutes. 3. This is not new information, but my husband, Drew, is an exceptionally good cook. Had I thought of this more, I would have refused to cook a long time ago, haha. He made egg drop soup this week that was awesome, and the best steak I have ever had today for lunch. 4. Isabel is so smart. This, also, is not new information, but it always shocks me. This week, I taught Isabel how to play Ring Around the Rosie. She adored it and wanted to play over and over and over again. We would walk in a circle, then when we got to "all fall down," she would yank my hands down, then immediately pull them back up so that I would get up and do it all over again. Of course, she never fell down and got back up, so she had a lot more energy at the end than I did, haha. 5. Isabel is rediscovering how much she adores the outdoors. We went to three different parks and the zoo this week and she had an absolute blast. Today, after 45 minutes of swinging, sliding, walking around the duck pond and even more swinging, the sweet girl cried and cried when we had to go, even though she was shivering and it was getting dark. I think she'd live outside if we would let her eat dirt and rocks, haha. 7. 25 weeks pregnant is SOOOOO much better the second time around! 8. Apparently, my childhood that I thought was pretty awesome was not as awesome as I thought because I never had a huge Lego set. 9. 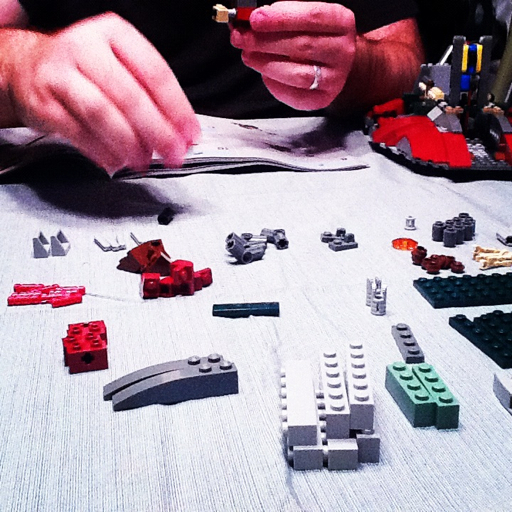 Drew is absolutely adorable huddled over a giant pile of legos, building the Slave 1 and humming Star Wars themes. 10. Again, not something new, but re-remembering is always good - I love my church and the people in it and I am proud to be a member of such a strong body of Christ. the video is not showing-it just goes to a general Youtube page. =( I enjoy reading your heart on your blog!